Your computer programming career may be on track, but does your resume still need a little debugging? Check out our sample programmer resume to see. To be a successful candidate for tech jobs, resume expert Kim Isaacs says it helps to have a comprehensive resume. Your computer programming career may be on track, but does your resume still need some debugging? 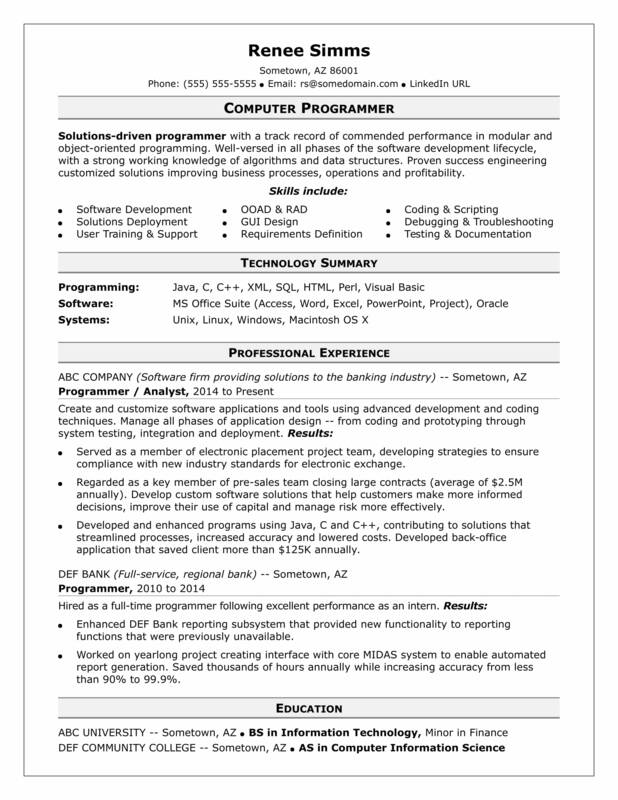 To find out, view the sample resume for a midlevel programmer that Isaacs created below, or download the midlevel computer programmer resume template in Word. Remember, you're at an advantage when it comes to job searching because computer programming can be done from anywhere in the world. But if you're looking to see where computer programmers are eagerly put to work, the Bureau of Labor Statistics (BLS) says you'll find the highest level of employment for this job in the following states: California, Texas, New York, Illinois, and New Jersey; and in the following metropolitan areas: New York City, Seattle, Chicago, Dallas, and Los Angeles. In terms of salaries, as a computer programmer, you can expect to earn a median wage of $82,240 per year, or $39.54 per hour, according to the BLS. You can check out an entry-level computer programmer resume sample and an experienced computer programmer resume sample to see more resume format tips. Additionally, you can learn more about IT careers and technology careers on Monster. Solutions-driven programmer with a four-year track record of commended performance in modular and object-oriented programming. Well-versed in all phases of the software development lifecycle, with a strong working knowledge of algorithms and data structures. Proven success engineering customized solutions improving business processes, operations and profitability. Served as a member of electronic placement project team, developing strategies to ensure compliance with new industry standards for electronic exchange. Regarded as a key member of pre-sales team closing large contracts (average of $2.5M annually). Develop custom software solutions that help customers make more informed decisions, improve their use of capital and manage risk more effectively. Developed and enhanced programs using Java, C and C++, contributing to solutions that streamlined processes, increased accuracy and lowered costs. Developed back-office application that saved client more than $125K annually. Enhanced DEF Bank reporting subsystem that provided new functionality to reporting functions that were previously unavailable. Worked on yearlong project creating interface with core MIDAS system to enable automated report generation. Saved thousands of hours annually while increasing accuracy from less than 90% to 99.9%. A strong job search requires a resume that communicates your skills and experience, as well as the value you'd bring to a company. Not sure your resume is up to code? Get a free resume evaluation today from the experts at Monster's Resume Writing Service. You'll get detailed feedback in two business days, including a review of your resume's appearance and content, and a prediction of a recruiter's first impression. It's a quick and easy way to set yourself on a path to an awesome new job.